EDMONTON, Alberta - The Wild will roll out a different lineup Tuesday against the Oilers at Rogers Place than the one that started this stretch of seven straight road games with a letdown Monday in Vancouver, but the objective for the group is the same: be ready right from the drop of the puck. A slow start contributed to the 5-2 loss to the Canucks, as the Wild seemed to be continually chasing the play – even after it tied the score at 1. And with phenom Connor McDavid on the ice, playing catch-up against him and the rest of the Oilers isn’t a strategy for success. Aside from Stalock taking over the crease from Devan Dubnyk, the Wild will also sub winger J.T. Brown in for winger Matt Read. 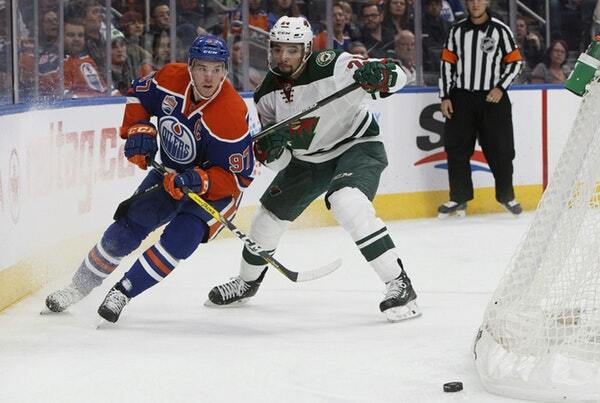 Perhaps those changes give the Wild enough of a fresh look to have energy to not only be engaged in the first period but also have the speed to keep up with the Oilers. 20: Penalty kills for the Wild in its last 22 shorthanded situations. 1-3: The Wild’s record on the road. 2-0: How the Wild has fared in the second half of a back-to-back. 4: Points in three games against the Wild last season for McDavid. 2: Wins for Edmonton in 2017-18 in three games vs. the Wild. Edmonton is one of the hottest teams in the NHL right now, as it’s won three in a row and has collected at least a point in four straight. McDavid has been the catalyst, landing on the scoresheet in all but one of the Oilers’ games so far. His 17 points rank fifth in the NHL. McDavid is the first Oiler since Mark Messier in 1989-90 to tally 17 or more points in the team’s first 10 games. Goalie Cam Talbot has had a save percentage better than .925 in four of his last five starts.